Click here for Martin Armstrong’s latest blog post entitled Dow Jones Rally. Martin’s computer model is calling for a DOW rally. Side musing: gg says: remember that the stock market is still moving in a long-term downward trend in purchasing power. That may affect your investment choices in the stock market long-term. Update: the link on Martin’s website has disappeared. Sorry. gg doesn’t have a copy. This week’s clip is from the great comedic play The Man Who Came To Dinner. This is Jimmy Durante’s big scene, which highlights his comic talents. Today Mr. Durante would be diagnosed with ADD and put on medication. groovygirl’s current feeling about the markets…..
What happens to mortgage debt in a hyperinflation? In theory, you are paying your mortgage debt with less valuable “dollars”. However, this theory makes a lot of assumptions to turn out in your favor. In a real hyperinflation, or even a severe inflation, you will be spending so much of your income on food, energy, and auto gas that you will not be able to afford to pay whatever small monthly amount your mortgage (or any other debt) has become. This theory also assumes that you 1) have a job and 2) the company you work for is solvent enough to increase your wages at the same rate and timeline as the hyperinflation/inflation. The last decade proved that even if your employer increased your wages with the official rate of inflation, you fell behind the real inflation rate around 5% per year. The best thing to hope for is the government puts a hold on all debt until the currency is “revalued”. Then you have to figure out if your debt just got larger in real value during the “revaluation” process and you are actual saddled with more debt than you had before in real terms. Pay down debt. It will make your life easier in a hyperinflation, cost-push currency inflation, currency collapse/revaluation, or extended loss of employment. One or more of these events will happen in the next 10 years. Burning Platform posted this letter from a friend on his website. Click here. One note: groovygirl read (somewhere, sorry, it was a while ago) that China’s upper middle and wealthy classes were considering leaving China, believing that their wealth could be taken away by the government. They want to come to America, believing their wealth will be better protected here. Groovygirl is not sure if every country is not caught in the oligarchy trap. The next question is: is a foreigner and his/her wealth and rights treated better in another country? So, where is the safe haven country? groovygirl has asked a few times in past posts about the recent LIBOR scandal: what are they going to do in the future? The really near future. This rate must remain low or the entire financial system blows up, period. Investors can not be allowed to determine the value of capital, they understand how rare it is. Here are some possibilities and their consequences. Important information. Video at the end, check it out. Click here for a very clear and important warning from Jim Sinclair to the investment community. How anyone can put any money in a securities/commodities clearinghouse is beyond me. You risk your financial life to win trading then end up with practically nothing whatsoever. The system is totally broken. Governments are busted. The securities insurance programs are wildly over extended by the fact that their capitalization cannot guarantee what they are supposed to be guaranteeing. Click here for Anaheim riots/protests. Police firing bean bag rounds at media. Didn’t see this on MSM, may have missed it. Bob Janjuah’s latest on stocks/economy, click here. Claims 800 S&P still in our future. How to spot disinformation tactics. Click here. Update: Compare the last gold cycle to the “bubble” market chart link below. Click here. Notice the first sell-off between 1974-1976. The gradual and then accelerating take off thru 1980. Then, the “high”, “denial”, and “return to norm” points? Then by 1983, we set up a new trading range of 300-500. Notice the mania period (point from hitting the last sell-off high a second time to final high) is about 3 years total and the fall after the high is less than 3 years? When the new low was established in 2001, a new cycle began. DOW Inflation-adjusted Chart: check out this chart of the inflation-adjusted DOW , look at 1982 to present. Notice the first sell off in 1987, the mania period from 1996-2000. We can also see the bull trap in 2003 and the “return to normal” in 2006. If this chart follows the typical bubble chart, gg would guess we are setting up a trading range (until the next cycle starts) below the green line. Side musing: You will also notice that during the period between 1960-1983, the DOW was in a bear cycle, while gold was in a bull cycle. And in 2000, the DOW entered another bear cycle and gold started its bull cycle. It is much easier to see these cycles if you use inflation-adjusted stock charts. The DOW and metal cycles tend to act this way. It is possible that around the time you want to sell gold/silver, it will be a real low in the DOW. But remember these are long-term investment cycles (running 15-20 years). If you need a quick return or constant annual income, you may want to spread investments over several different options. Long-term investment cycles are about keeping your capital intact over generations. Totallygroovygirlfriday is as impatient as the next PM investor. However, I don’t let my emotions get the best of me. And let me tell you, it is not easy. In the mist of all the noise, I often refer to this chart of a typical “bubble” market. It is actually a chart of a normal market cycle. It helps me put things in perspective. We are not in a bubble in gold and silver, far from it. This is a picture of a bubble. Click here. Groovygirl used to think that the first sell off was in 2008, when we dropped from $800 to $500. But gg is thinking now that the first sell off might be this last one from 1900 to 1500. It received a lot more attention. Also the public really isn’t in the game yet, and gg thinks they will get in after gold goes above the last high ($1900). If you think this time line is 20 years and the low was in mid 2001, then the first sell off lines up pretty well with the middle of the 20-year cycle. It also falls in line with Martin’s year for a high in 2017-2018. (Or if you go with 15 year cycle, 2008, could have been the first sell off.) GG is leaning more towards a 20-year cycle. But that is just conjuncture. This is a psychological chart, not an investment chart. Just another tool to keep things in perspective. gg is also not convinced either way that gold will stay at an artificial high due to a new currency or debt revaluation. Conclusion: we are not in the bubble part of the gold investment cycle yet. And when it hits, it will happen pretty quickly. Side musing: remember the housing bubble? 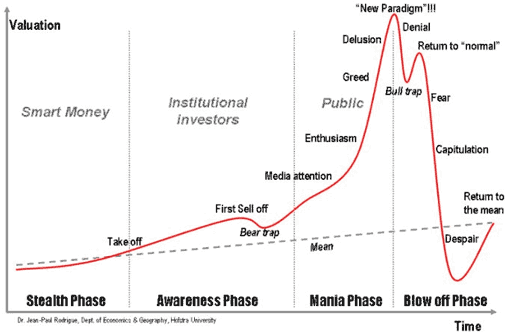 The main mania phase was only a few years: around 2004 to 2007. That housing bubble mania phase helps us know when a mania phase is really upon us. All banks are in the mortgage-lending business, your relatives and neighbors are “flipping” houses, banks are lending to dead people for profit, everyone is taking equity out of their house……. Everyone (banks, news media, your neighbor) thought the housing market could never go down.